Fatigue is a physical and/or mental state caused by overexertion. It is an acute, ongoing state of tiredness that leads to mental or physical exhaustion and prevents people from functioning within normal boundaries. It is more than feeling tired and drowsy. It is a physical condition that can occur when a person’s physical or mental limits are reached. Fatigue can be caused by factors which may be work related, non-work related or a combination of both and can accumulate over time. In a work context, fatigue reduces an employee’s ability to perform work safely and effectively. It reduces the employee’s capabilities to an extent that may impair his strength, speed, reaction time, coordination, decision making, or balance. It can occur because of prolonged mental or physical activity, sleep loss and/or disruption of the internal body clock. Fatigue is caused by prolonged periods of physical and/or mental exertion without enough time to rest and recover. It is a catch-all term for a variety of symptoms, ranging from muscle pain to difficulty in concentrating, or sleepiness. It can compromise health and safety at work and is a common outcome of stress and shift-work. Fatigue is defined as ‘the temporary inability, or decrease in ability, or strong disinclination to respond to a situation, because of inadequate recuperation from previous over-activity which can be either mental, or emotional, or physical’. Fatigue can be considered as local or general, acute or chronic. Acute fatigue is the result of sudden and/or severe exposure or onset, while chronic fatigue usually develops after longer exposures, often of a significantly smaller intensity than present in acute fatigue. Chronic fatigue develops slowly. A common symptom of fatigue is an unpleasant, general sensation of weariness. Other outcomes of fatigue include a general disinclination for effort, sluggish thinking, reduced alertness and a reduced ability to perform both physical and mental tasks. Fatigue is generally caused by spending long periods of time awake and having an inadequate amount and/or quality of sleep over an extended period. Factors both in and outside of the workplace can be a source of fatigue. Fatigue can be a major source of stress among employees, and it can significantly affect an employee’s capacity to function. It can impact on the employee’s performance and productivity, and increase the potential for workplace injuries to occur. A level of fatigue is a natural response to the mental and physical effort of everything the employees do. Normally, good quality sleep reverses the imbalance, allowing the body and the brain to recover. However, working long hours, working with intense mental or physical effort, or working during some or all of the natural time for sleep can all cause excessive fatigue. Fatigue can also have long term effects on health. Fatigue has obvious implications for workplace and employees’ safety since fatigue reduces alertness and leads to errors. There is the potential for an increase in incidents, accidents and injuries to occur especially when the employee under fatigue (i) is operating machinery or driving vehicles, (ii) is undertaking critical task that requires a high level of concentration, (iii) is carrying out some activity where the consequence of error is serious, or (iv) is undertaking night work when he is normally be sleeping. The effects of fatigue on health and work performance can be short term and long term. Short term effects on the employee include impaired work performance with reduced ability to (i) concentrate and avoid distraction, (ii) think laterally and analytically, (iii) judge and make decisions, (iv) remember and recall events and their sequences, (v) maintain vigilance, (vi) control emotions, (vii) appreciate complex situations, (viii) recognize risks, (ix) coordinate hand-eye movements and hence have lower visual perception, and (x) communicate effectively on interpersonal level. Fatigue can also (i) increase error rates, (ii) slow reaction times, (iii) reduce memory, (iv) increase the likelihood of accidents and injuries, and (v) cause micro-sleeps (falling asleep for less than a second to a few seconds, and being unaware they have done so). Long-term effects on health that are associated with shiftwork and chronic sleep loss may include (i) heart disease, (ii) diabetes, (iii) high blood pressure, (iv) gastrointestinal disorders, (v) depression, (vi) lower fertility, and (vi) anxiety. Fatigue can be caused by work-related factors, outside factors, and/or a combination of both. It may accumulate over time. There are several work-related and non-work related factors that can contribute to its development. Work-related factors influencing fatigue include (i) extended hours of work, (ii) type of work such as mentally or physically demanding work, (iii) work demands placed on the employee such as timeframes, deadlines, and intensity, (iv) shift work including roster pattern, timing and length of shifts, (v) inadequate recovery time between shifts, (vi) early or late shifts, (vii) poor work scheduling and planning, (viii) job design, (ix) inadequate rest breaks, (x) lengthy periods of time being awake, (xi) harsh environmental conditions such as climate, light, noise, and workstation design, (xii) working in a second job, (xiii) organization’s culture, and (xiv) employee’s role within the organization. Non-work related factors influencing fatigue include (i) extended commuting times, (ii) heavy family and social obligations, (iii) high level of social/community activities, (iv) emotional issues (e.g. relationship pressures), (v) age, and (vi) poor health and fitness levels causing sleep loss, sleep disorders or poor quality of sleep. The signs which shows the fatigue in an employee include (i) headache and/or dizziness, (ii) wandering or disconnected thoughts, daydreaming, lack of concentration, (iii) blurred vision or difficulty keeping eyes open, (iv) excessive and constant yawning, a drowsy relaxed feeling or falling asleep at work, (v) moodiness, such as irritability, (vi) short term memory problems and inability to concentrate, (vii) low motivation, (vii) delusions, (viii) impaired decision-making and judgment, (ix) slowed reflexes and responses, (x) reduced immune system function, (xi) increased errors, (xii) extended sleep during days off work, (xiii) getting micro sleeps, and (xiv) drifting in and out of traffic lanes or missing gear changes and turn offs when driving. Given the multiplicity of causes, management must take complaints of fatigue seriously, particularly in an employee with an established, acceptable work pattern. The employee’s general state of health is to be considered as well as his work practices and hours of work. However usually it is difficult for the management to do this. There are a number of factors that can contribute to fatigue and are required to be taken into consideration as they may indicate areas where action are required to be taken to reduce risks. Many of these hazards can be interrelated and in some cases cumulative. These factors are described below (Fig 1). Mental and physical demands of work – Concentrating for extended periods of time, performing repetitious or monotonous work and performing work that requires continued physical effort can increase the risk of fatigue by producing mental and/or physical tiredness. Employees can be mentally and physically fatigued at the same time. Work scheduling and planning – Scheduling work in a way that fails to allow employees enough time to physically recover and socialize can cause fatigue. The time of day (or night) work is performed and the number of hours worked in a working shift can impact on the risk of fatigue. Working at times when the employees are biologically programmed to sleep and working for long periods of time can contribute to fatigue. Environmental conditions – Working in harsh and/or uncomfortable conditions can contribute to fatigue, for example, working in extremely hot or cold environments or noisy workplaces can make the employees tire quicker and impair their performance. Organizational factors – Organizational factors that can contribute to fatigue include (i) culture of the organization towards work extensive hours, (ii) lack of flexibility at the workplace, (iii) lack of clear work procedures, (iv) incentives schemes, wages and conditions that may lead to fatigue, and (v) lack of information and training given to the employees on fatigue. Individual and lifestyle factors – Factors which cause fatigue due to sleep deprivation include (i) lifestyle, (ii) environment at home, (iii) health conditions, (iv) other work commitments, for example, having a second job, and (v) extended travel to home after/before the work. The body has a natural rhythm that is repeated every 24 hours – this is known as the ‘body clock’ of the human being. Human body clock regulates functions including sleeping patterns, body temperature, hormone levels and digestion. As it is programmed for different levels of wakefulness, individuals experience different levels of alertness depending on the time of the day. When the human body clock is out of step, the human alertness decreases and as a result individual has a feeling of fatigue. This increases the risk of making errors and causing accidents and injuries, either in the workplace or on the way home from work. Shift employees are one of the main groups of employees which are affected by fatigue. Body clock rhythms do not generally adjust easily to shift work. In many workplaces shift work, and particularly night work is unavoidable and therefore fatigue is required to be proactively managed. Sleep disruption is the most common problem for shift employees as a sleep cycle is usually shorter after working a night shift or if work begins at 6 am (morning shift). The level of tiredness increases with the number of hours worked and is more pronounced during the second half of the shift, especially between 2am and 6am and between 2pm and 4pm. Sleep is the only effective long term strategy to prevent and manage fatigue. While tired muscles can recover with rest, the brain can only recover with sleep. The most beneficial sleep is a good night’s sleep taken in a single continuous period. The optimum amount of sleep varies for each person, however, an average adult generally requires 7 to 8 hours of sleep daily. When individuals get less sleep than they need in a day, they build up a sleep debt which accumulates until they get enough sleep to overcome the sleep debt. Each additional day without enough sleep increases the debt, and when it becomes large enough fatigue occurs. It may take several days before a person recovers from a sleep debt. Sleep debt is common with employees having night shift work since with night shifts employees often have difficulty to get sufficient and undisturbed sleep during the day. 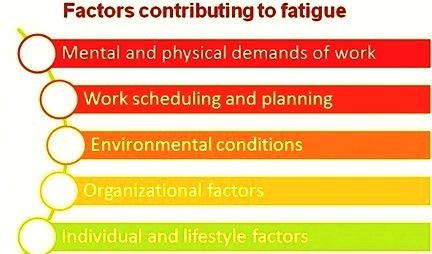 The best way to control fatigue risks is to eliminate at the source those factors which are causing it. If this is not reasonably practicable, then it is necessary to minimize the risks. When taking decisions on the control measures to be implemented, there is a need to check to see what is currently being used to address the problem and if they are effective. The controls that are being chosen also depend on the employees carrying out the work, the type of the operations, and the undertaking and the characteristics of the organization. As an example, procedures need to be developed in those areas, where there is increased risk of injury due to the fatigue. There are a number of controls measures that can be implemented to prevent fatigue. These are as follows. Mental and physical demands of work – These include (i) use of those plant, machinery and equipment which helps in reduction of fatigue for repetitive tasks need to be performed, (ii) redesigning of the job to limit periods of excessive mental or physical demands, (iii) introduction of job rotation to limit a build-up of mental and physical fatigue, (iv) reduction of the time which the employees need to spend performing physical and mental demanding work by using rest periods (in addition to scheduled breaks if any) or implementing shorter shifts, and (v) development of contingency plans for potential situations that could arise where employees have to unexpectedly work longer hours, more shifts or a long sequence of shifts, for example, in emergencies. Work scheduling and planning – This include (i) scheduling of the safety critical work outside low body clock periods (e.g. not between 2 am and 6 am or 2 pm and 4 pm), (ii) proper managing of the workload and the work-pace change caused by machinery breakdowns or planned and unplanned absences, (iii) avoiding of the working arrangements that provide incentives to the employees to work excessive hours, (iv) inclusion of the rest periods in the work schedule and accommodation for napping and sleeping if necessary, (v) ensuring that there are enough employees and other resources to do the job without placing excessive demands on them, and (vi) ensuring that the work demands increase towards the middle of the shift and decrease towards the end. Environmental conditions – These include (i) avoidance of working during periods of extreme temperatures, (ii) installation of cooling devices and/or provision of access to cooled areas in hot working environments, (iii) installation of heating devices in cold working environments, (iv) provision of shelter in hot working environments, (v) installation of ventilation and mechanical cooling devices in hot and confined spaces such as in operator’s cabins, (vi) provision of adequate facilities for rest, sleep, meal breaks, onsite accommodation (if appropriate) and other essential requirements, (viii) installation of adjustable, vibration-free seats in appropriate machinery and vehicles, and (ix) ensuring the workplace and surroundings are well lit, safe and secure. Organizational factors – These include (i) implementation of effective human resources policy and procedures, for example, procedures on rostering policy and for working overtime, (ii) encouraging the employees to report any concerns they may have about work-related fatigue, (iii) ensuring that the managers and supervisors are trained to monitor fatigue levels in their team in order to prevent and manage fatigue, (iv) considering measures to deal with risks where employees drive home tired or fatigued after long working hours or night work shifts, (v) considering alternative options to face-to-face meetings such as teleconferencing, (vi) requiring field staff working long hours on a project to sleep overnight to avoid driving when tired or fatigued after project completion, for example, scientists or geologists carrying out research drive long distances to get home after their last day of work in a remote area, (vii) providing assistance for the employees when it becomes apparent that long working hours are needed for meeting of the schedules, (viii) reviewing the need for subcontractors or labour hire staff to work similar shifts and shift cycles to the permanent workforce, (ix) developing procedures for dealing with fatigued employees, and (x) allowing trial periods for new working arrangements and evaluating them. Individual and lifestyle factors – Work and lifestyle often impact each other. For example, if an employee leaves his job tired and exhausted he may be less able to enjoy out of work activities or could be a danger to himself and others in the community. Likewise, if an employee arrives at work unfit for duty due to the lack of sleep, illness or other condition, he may be less productive or could be a danger to himself and other employees in the workplace. To avoid any potential conflicts between personal and work demands of the employees, required controls include (i) consultation with the employees and design shift rosters that enables employees to meet both work and personal commitments, and (ii) development of a fitness for work policy and implement health and fitness programs. The planning of work schedules for elimination of fatigue at the workplace has the following components. Working time – The working time include (i) elimination or reduction of the need to work extended hours or overtime, (ii) development of a working-hours policy on daily work hours, maximum average weekly hours, total hours over a three-month period and work-related travel, (iii) development of procedures for long daily work hours and related travel, where there may be increased risk of injury – for example, requiring minimum breaks on a regular basis, especially when total hours exceed maximum limits, (iv) designing of working hours to allow for good quality sleep and enough recovery time between work days or shifts for travelling, eating, washing and sleeping, (v) elimination or minimizing of the need to work long shifts for more than three consecutive day, and (vi) scheduling of the work for hours when the risks may be lower (e.g. complex and safety-critical tasks are best undertaken during normal day shifts when employees are less likely to be fatigued). Breaks during working time – This includes (i) ensuring that employees have adequate and regular breaks so they can rest, eat and rehydrate, and (ii) providing flexibility and encouraging employees to take breaks as required. Rostering – For effective rostering the necessary issues are (i) use of appropriate shift rotation system. A forward rotation system means the direction of the roster is the day (A) shift to the evening (B) shift to the night (C) shift whereas a backward rotation shift is from day to night to evening, (ii) designing of the rosters so there is adequate recovery time between shifts to travel, eat, wash and sleep, (iii) avoiding morning shifts with early starts (before 6 am), (iv) shortening of shift length to 8 hours, (v) considering the timing of split shifts, for instance, whether there could be sleep disruption because of the times employees are required to work, (vi) considering avoiding split shifts that involve, for example, early morning work and late night work as they can affect the amount of night sleep, (vii) offering alternatives to the employees who may have difficulties adjusting to working hours, and (viii) ensuring rosters reflect an appropriate mix of the employees with different skills. Shift work – This include (i) setting the shift rosters ahead of time and avoid sudden changes to allow the employees to plan leisure time, (ii) avoiding quick shift changeovers, such as finishing at 10 pm and starting again at 6 am, (iii) controlling overtime, shift swapping and on-call duties, (iv) allocating shift employees consecutive days off, including some weekends, (v) trying to fit shift times in with the availability of public transport, (vi) providing alternative transport at end of overtime/long shift, (vii) limiting shifts to 12 hours including overtime, (viii) allowing time for communication at shift handovers, (ix) maximizing breaks between shifts and before rotating staff to a new shift, (x) minimizing the number of consecutive night shifts, (xi) avoiding overtime allocation after afternoon or night shifts (particularly after 10 or 12 hour night shifts), and (xii) providing information to shift employees that contains tips for them to prevent and manage fatigue. On-call and call back work – This includes designing of shifts and rosters to allow for good quality sleep and enough recovery time. Opportunities for sleep and recovery in instances are to be considered where workers are required to work on call after a normal shift or on days off. Also a policy is required to be made in consultation with the employees on on-call work. Leave management – Leave management is important for controlling the fatigue at the workplace. This includes (i) put in place processes to manage accrued leave balances and requests for leave, consideration of future rosters and schedules when approving request for leave or shift swaps, (iii) consideration of setting maximum amounts of leave accrual and optimal amounts of leave that can be taken at one time, (iv) filling vacant positions as soon as reasonably practicable, (v) ensuring the impact of service delivery needs on employees is considered, (vi) ensuring rosters reflect approved leave, (vii) ensuring sufficient employees are made available to fill a roster, (ix) maintaining a relief pool in high demand areas. Absenteeism – It is necessary to put in place processes to manage absenteeism, accrued leave balances and requests for leave. Also necessary is to develop plans to deal with workload changes due to absenteeism. Employees need to be provided with training and information on how to manage fatigue at work, as well as beneficial practices to minimize the risks, such as gaining sufficient sleep. Training is an integral part of educating employees about the hazards and risks associated with fatigue at the workplace. It gives them knowledge and skills not only to do their job but also implement appropriate control measures that can ultimately prevent fatigue from occurring. Training is required to be arranged so it is available to all the employees on all the shifts. If employees are needed to attend training outside normal shifts, it is to be considered work time and rosters are to be adjusted accordingly. Employees training is to include (i) the work health and safety responsibilities of everyone in the workplace, (ii) the body clock and how fatigue can affect it, (iii) risk factors for fatigue, (iv) symptoms of fatigue, (v) hazards and risks that may be associated with fatigue, (vi) effective control measures for fatigue (e.g. work scheduling, shift work schedules), (vii) procedures for preventing fatigue, (viii) effects of medication, drugs and alcohol, (ix) nutrition, fitness and health issues relating to fatigue, and (x) balancing work and personal lifestyle demands. The training of managers and supervisors is also to further include how to recognize fatigue indicators and understanding of the various ways to prevent and manage fatigue along with their implementation. Employee’s fatigue adversely can impact personal health and safety as well as the efficiency and safety of operations. The most effective method to minimizing employee’s fatigue is through a comprehensive fatigue risk management system (FRMS). An FRMS requires the active participation of all parts of the organization, including management, support functions and employees. Fatigue and decreased alertness resulting from insufficient or poor-quality sleep can have several safety-related consequences, including slowed reaction time, reduced vigilance, reduced decision-making ability, poor judgment, distraction during complex tasks and loss of awareness in critical situations. Employees usually believe they adapt to chronic sleep loss or that recovery requires only a single extended sleep episode, but studies have shown that this is not the case. Preventing and reducing fatigue lead to the following.